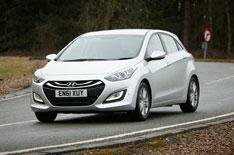 2012 Hyundai i30 UK review | What Car? This is the all-new Hyundai i30, a rival for big-hitting small family hatchbacks such as the Ford Focus and Volkswagen Golf. Its launch is also a significant moment for the company, because it's the first time Hyundai has replaced one of its 'i' models. The outgoing i30 was the first car with the new naming structure when it was launched four years ago. The new model's brief is to take the fight to the Ford Focus and VW Golf with a package that will lift it above the 'budget' tag it's previously traded on. Prices start at 14,495, which is considerably less than the cheapest versions of its Ford and VW rivals, yet the i30 has standard equipment that they make you pay extra for or simply don't offer at all Bluetooth connectivity, for example. What's the 2012 Hyundai i30 like to drive? It's fair to say that the i30 isn't the most fun car in the class to drive, but there's no doubting that this is a fine car. Rather than out-and-out entertainment, the emphasis is on comfort and everyday usability. That's most obvious in the way the car rides, because it manages to soak up pretty much anything that our UK roads can throw at it, no matter what speed you're going. Just occasionally, you'll notice a firmish edge to the ride in town, but that's very much the exception to the rule. Most of the time, the occupants are blissfully unaware of the state of the road beneath them. The price you pay for this is body roll in corners, but it's always well controlled, so it's no problem. The only weak link is the steering, which is a little too vague and suffers too much play at the straight-ahead position. Mind you, it's perfect for manoeuvring around town. We tried three of the five-strong engine range, and the diesel units proved the most impressive. The 109bhp 1.6 CRDI (which emits a tax-friendly 97g/km CO2) has a particularly fine blend of economy and performance so good in fact that it makes the 126bhp version seem like a needless expense, especially because it only comes with the top two trims. Yes, the 126bhp does feel a little stronger and more responsive through the rev range; but, when you can get into a 109bhp unit with Classic trim for just 16,895 and the cheapest 126bhp model is 2400 dearer and a little less economical, there's no contest. Next to the diesel engines, the 1.4-litre petrol unit seems rather weedy. It's nowhere near as strong or as flexible as the CRDi units, and when you rev it hard to keep up with traffic, it's noisy. You'll have no great problem if you only ever want to pootle around town; but given that this engine also has worse economy and higher emissions than the diesels, its only real attraction are its list prices: at least 2000 less than the comparable diesel. What's the 2012 Hyundai i30 like inside? Again the emphasis inside the i30 seems to be on easy everyday driveability, and the dashboard is the perfect example. First, it's far more stylish and classy than in the previous car's, but secondly it's very easy to use, thanks to its well laid out, large buttons. On top of that, there are plenty of cubbies around the cabin, and no shortage of space for the occupants. Even those over six-feet tall will have plenty of space in the front, and the rear-seat space is as generous as in any car in the class. You'll even be able to get three people across the rear seat in reasonable comfort. Last, but not least, the boot is well-sized, too: at 378 litres, it's bigger than those in both the Focus and Golf. Yes and not just because it's good value. Although that and the excellent buying package five-year warranty and breakdown cover, with three years' servicing available for 299 across the range are pretty strong arguments on their own. With its package of high quality, generous space and practicality on top of its sheer value for money and good driving manners, the i30 is worthy of comparison with the very best cars in its class. Anyone in the market for a Ford Focus, Vauxhall Astra, or VW Golf should certainly put the i30 on their shortlist.